As a woman who is passionate about coffee, having fun and spending quality time with friends and family……. Coffee Talk by Pressman is the perfect game to play especially during the holidays. The concept is simple and the game play is fast paced and enjoyable. Even my husband who does not normally like to play games thinks this is a lot of fun and will frequently join me in the evenings. I like that there are 150 Topic Cards with 300 topics so it is always interesting and we have yet to duplicate one. I can’t wait for my sister and family to visit over the holidays so we can play Coffee Talk, I am confident that it will be a hit. 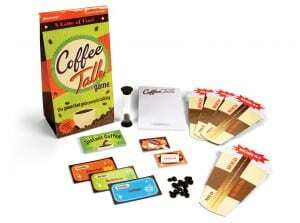 The Coffee Talk Game is affordably priced at only $14.99 and would make an excellent gift idea. It is available for purchase online by visiting Pressman(R) website. Connect with the Coffee Talk Game on Facebook too.